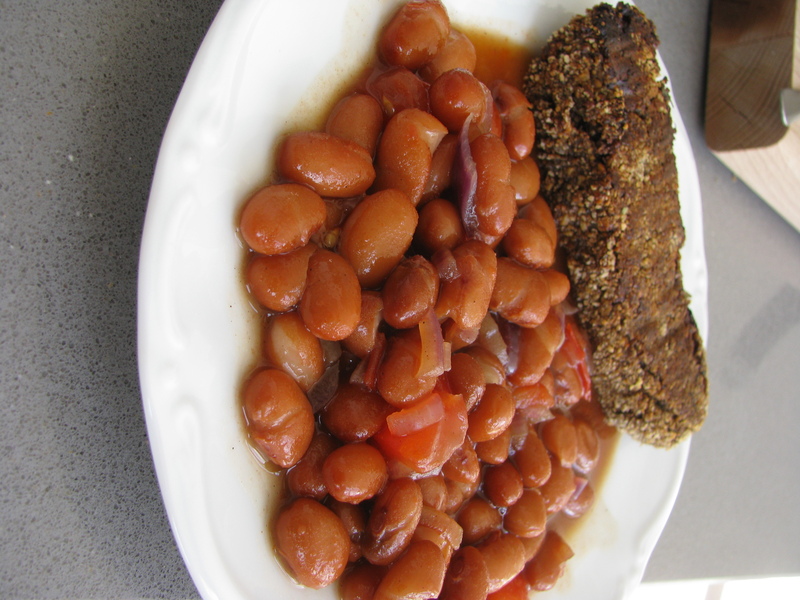 Beans and ¨sausage¨ | Fork off, heart disease! My husband and I run every weekend. I do my measly 6K whilst he does his half-marathon. That´s right: every.single.weekend. The man is a machine, I tell ya. If you think that eating a plant-based diet will slow you down, he can tell you otherwise. Anyway, after our run, we like to indulge in our little Sunday tradition that we adopted whilst living in England: the breakfast fry-up. Now, this used to consist of beans in tomato sauce from a tin, veggie sausage for me, meat for the hubby, toast, eggs and whatever accoutrements we could muster from our cupboards. Now that we are both eating a plant-based diet with little to no fat and processed foods, I thought I would experiment a little. Instead of the usual store-bought veg sausage, I thought I would give a homemade one a go. The sausage had to be gluten flour-free (hubby cannot tolerate high gluten products such as seitan). I found this recipe on Chew on This Vegan which sounded quite nice: pear sage sausage. Since I did not have pear butter, I substituted with appelstroop, which is a thick apple jelly that is very popular here in the Netherlands. I also subbed marmite instead of nutritional yeast as well. The result was pretty good, but I have to work on the texture (too mushy) and the flavouring. Next time, I will reduce the amount of appelstroop since it overpowered the sausage. In my experiment, I used 1/2 cup but I think 1/3 cup is probably sufficient but you will have to add to taste. I use ¨sausage¨ loosely cause like my husband said: ¨this has nothing to do with sausage but it tastes pretty good!¨. Preheat the oven to 190°C and line a baking sheet with parchment paper. Mixing the dry ingredients: Combine everything (flax through salt) in a small bowl, whisk to combine and set aside. Do not add the water yet. Mixing the wet ingredients: Combine the walnuts, cooked rice and marmite in a food processor and pulse until coarsely ground. Transfer to a large bowl and add the apple butter, stirring to thoroughly incorporate it into the walnut mixture. Making the slurry: Add the hot water to the small bowl of dry ingredients and whisk or stir until everything is completely incorporated. The slurry should be a pudding consistency – add water 1 tablespoon at a time if your slurry is too thick. Final mix: Add the slurry to the walnut mixture and stir until everything is completely mixed together. At this point, I thought the mix was too wet so I added some breadcrumbs (about 1/4 cup) but you will have to experiment to get the texture right. Take a ball of dough and roll into a sausage shape. Roll the shape into breadcrumbs and place on the baking sheet with the parchment. You will end up with about 8 sausages. Bake for 20 mins, then flip over and bake for an additional 10 – 15 mins. In a frying pan over low to medium heat, toss in the red onions and tomato and sprinkle some salt to help release the juices. Gently fry until the pan dries, then toss in a bit of water to de-glaze the pan. Add some freshly cracked pepper (to taste). 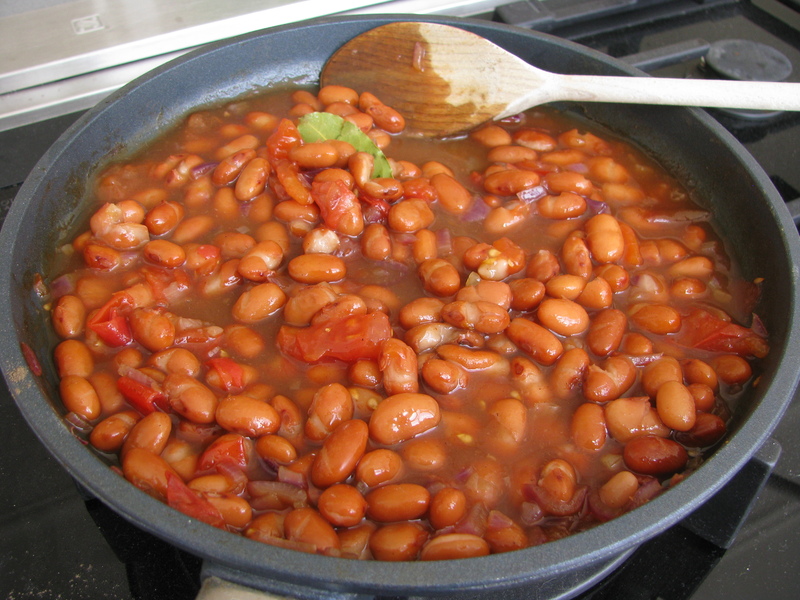 Toss in the contents of the pot of beans (without draining), along with the marmite and bay leaf. Heat through and serve.